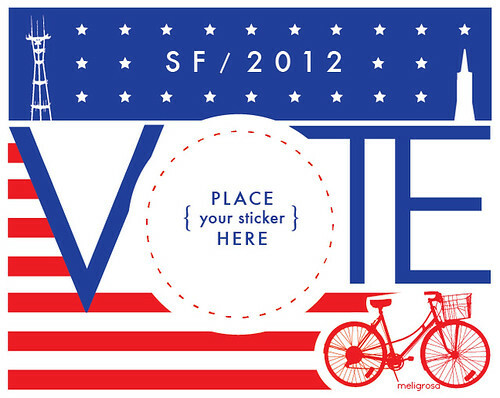 I made this little card for the United States 2012 presidential election, which is today Tuesday, November 6th. Laminate it, bike it as a spoke-card, postcard it, read as bookdivider Etc. Here in San Francisco voting stickers are 2" but should fit most voting stickers or draw on it your own if you have voted by mail or sent in your absentee ballot. Print › share › use them as you'd like. Vote. I did, and I feel so much better now. It's good for what ails you - and it can, if properly done, be good for what ails our country. Did your bike chose you?